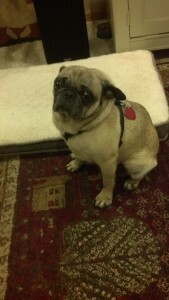 Marie is a 4-5 year old female who doesn’t quite fit her name. She’s so tiny we’ve nicknamed her Little Bit. But there is nothing tiny about her personality. She is full of friendliness toward other dogs, cats and our grandsons (8 & 12 years old). She walked right up to our two cats upon first sight wagging her tail and sniffing noses, even though both our cats are very much larger than herself. She immediately attached herself to our resident older female Pug like a little sister. She’s learning how to be a “house Pug” by following her around and imitating her actions. She will be an excellent “Watch Pug” as she has learned from our Pug to bark and come find me if anyone comes to the door, but is all friendliness when I let them in. As I move about the house my wife calls it a “Pug Parade” as everywhere I go I’m followed by first our pug Katie who is in turn followed by Marie. She will be a great dog for the whole family.